Is the first satnav from Mio and Navman's joining doubly good? 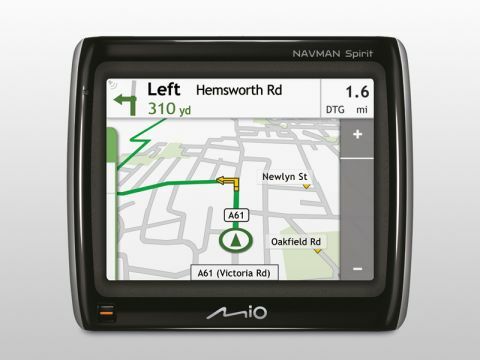 The S305 is the first sat nav we've seen from Mio Navman since the two companies merged last year, and is the entry-level product in the range. With a 3.5-inch screen, it fits easily in a pocket. The screen is bright and easy to view in all conditions, but the 320 x 240-pixel resolution could be sharper. Featuring touchscreen technology, all of the functions are carried out using large onscreen buttons. The menu isn't very intuitive – it's easy to find destinations by address or postcode, but if you want to take advantage of the advanced search features, then you'd better get used to hunting around or reading the manual. A button on the bottom-right makes it easy to go back to the home page, however. While we're certain this product does indeed have a larger-than-average points of interest (POI) database, the unintuitive menus make it a tricky feature to praise. It also only comes with an extended search list for London, so if you live outside the capital, extra cities will cost an extra £20. We tried to find specific types of shops, but searches proved unsuccessful. It's easier to search for the places around you, however, with icons appearing on the map that you can tap for further details. This device is a lot more successful for simple navigation, providing precise and accurate directions throughout our testing. The visible directions are simple and easy to follow, as are verbal directions. Features such as lane assistance are notable for their absence, however. The cradle is compact and will easily fit in your pocket, and when attached to a windscreen it offers a useful amount of adjustability. We found it stuck to the window without issue and was easily removed once we reached our destination. Overall, the S305 is a good product, providing accurate guidance at a reasonable price. It's not great, however, and it's most unique feature – a larger-than-average POI list – disappoints. As such, it's hard to recommend it.